Kris Kristofferson lyrics are for your personal use only, Kris is a great entertainer and an exceptional songwriter. We all know Kris Kristofferson as a singer, songwriter, musician and actor. His genres are folk, country, rock and outlaw country. He plays the guitar, piano, and harmonica and is the sole writer on most of his many many songs. He has received numerous awards throughout his long lustrous career and was inducted into the country music hall of fame in 2004 which was much deserved. 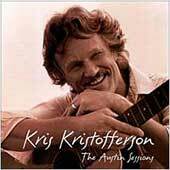 Low prices on Kris Kristofferson's Cds and easy to download MP3s.